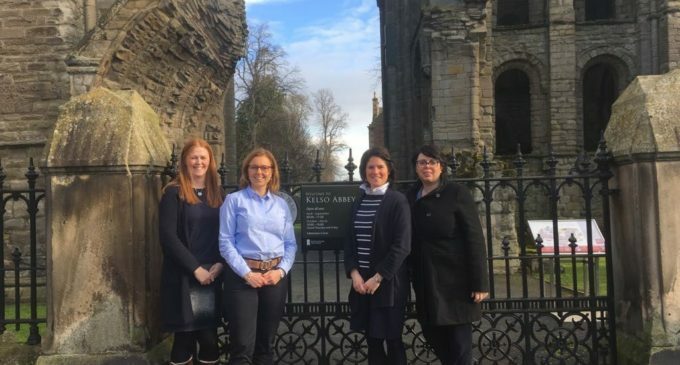 A tourism and hospitality event has been confirmed for later this month in response to concerns from local employers in the Scottish Borders about a future skills gap. Organised by a group of individuals and institutions, A Taste of Borders Tourism aims to welcome to Kelso Racecourse more than 180 pupils from secondary schools across the area. Once there, they will be given the chance to learn more about the opportunities in the sector, in addition to finding out more about the skills required to succeed in the industry. Scheduled for 26th February and sponsored by CIS Excellence Independent Hotel of the Year co-sponsor, Bruce Stevenson Insurance Brokers, the initiative has been spearheaded by Scottish Borders MSP Rachael Hamilton (pictured above, second from left) together with institutions including Borders College. Rachael Hamilton MSP for Ettrick, Roxburgh and Berwickshire, said: ‘Tourism contributes around £20m to the Borders economy and so it’s important that young people know what skills they need to get ahead in the sector, what exactly a career in tourism and hospitality offers and what it needs. DYW Borders programme manager, Andrea Hall, added: ‘A Taste of Borders Tourism is all about bringing together industry specialists to meet pupils who are taking a tourism or hospitality-related subject in their senior phase.